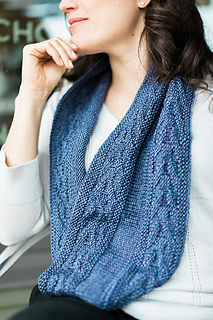 Knit and purls are all you need to create this beautiful cowl. 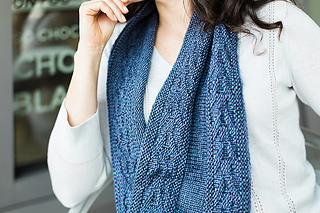 The interesting textured stitch pattern, a perfect pairing of traditional Garter and Stockinette stitch, captivates, and it is super quick to whip up in Superwash DK! This cowl is worked in the round and is written for two sizes – a small cowl and a larger infinity scarf. 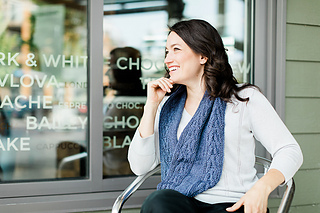 The infinity scarf size is shown. The Reedy Creek stitch pattern is both written (see Stitch Instructions) and charted. 18 sts and 32 rnds = 4” / 10 cm in Reedy Creek patt, after blocking. 18 sts and 28 rnds = 4” / 10 cm in Stockinette stitch, after blocking.